​Those who have researched Franz Josef Haydn’s “The Creation” are aware that Haydn did not start composing an oratorio until late in life. The catalyst for his decision came from his trips to London in 1791 and 1794. Following the death of Prince Niklaus I in 1790, Anton, his successor at the Esterhazy Palace, had no interest in music and disbanded the Court Orchestra and released Haydn from his responsibilities. Anton’s father prior to his death granted Haydn a pension of 1000 Florins per year for the rest of his life. For the first time in decades, he was free to travel and accepted the invitation of violinist and promoter Johann Peter Salomon, who acted as concert Manager for Haydn’s first visit to England, to travel there. He arrived in London on January 1, 1791 and stayed until July 1792. ​Haydn returned to London in January 1794 and stayed into 1795. During his visits to England, Haydn composed 250 works, a body of work equal to or larger than the career output of many other composers of his time. It was during these visits that Haydn was introduced to the oratorio form. George Frederic Handel was a revered composer in England, and Haydn attended festivals that featured Handel’s music. One such festival had over three thousand singers performing Handel’s “Messiah,” the likes of which Haydn had never seen nor heard. He was absolutely dumbfounded by the experience. G. H. Purday (1799-1885) reported that his music-seller father had been present at that very moment. Josef Haydn mentioned that he would like to write an oratorio but was wondering where to start. François Barthélemon, leader of the London orchestra that played Haydn's symphonies, picked up a Bible and said: "There, take that, and begin at the beginning." ​Upon leaving England in 1795, Johann Salomon presented Haydn with a poem titled “The Creation of the World.” Apparently, the poem had been offered to Handel, but he never set it to music. Haydn presented the poem to his friend, mentor, and librettist Baron Gottfried van Swieten when he returned to Vienna, and it was van Swieten who used the poem to develop a libretto for “The Creation” in both English and German. Now, this is where it gets interesting. On June 15, 1792 during his first London tour, Josef Haydn visited astronomer William Herschel at his observatory near Slough. In addition to being an accomplished musician and composer, William Herschel was famous for discovering the planet Uranus ten years earlier. William Herschel was a consummate lens grinder, and he and his sister Caroline spent hours and hours grinding ever larger lenses to construct telescopes to view the heavens in great detail. During his career, William Herschel built over 400 telescopes. Some say that Herschel invited Haydn to view the heavens through his main telescope, a rather massive construction in the yard behind his home that was 40 feet long and had mirrors 48 inches in diameter. For 50 years, it was the largest telescope in the world. ​There is only one problem. The guest book at the observatory in Slough for that day shows that Haydn visited during the day, when it was not possible to view the heavens. Furthermore, William Herschel was not there that day and was visiting friends in Scotland. However, his sister Caroline, who was his assistant, was there, and she most likely took Haydn on a tour of the observatory and had discussions with him about their observations. ​Of course, in 1792 there were no cameras. To document their observations, astronomers would sketch them, and it is a good possibility that Caroline supported the descriptions of the “wonder of His works” with sketches of the more captivating images, such as Saturn with its rings, or drawings of nebulae, such as the NGC 1514 Planetary Nebula discovered in 1790 by William Herschel. In fact, on 26 February 1783, Caroline made her own first discovery. She had found a nebula that was not included in the Messier catalogue. That same night, she independently discovered NGC 205, the second companion star cluster of the Andromeda Galaxy. ​One can only imagine what went through Haydn’s mind as he listened to Caroline Herschel and looked at those sketches of the heavens. Part of the discussion could have included the nebulae they were discovering and their role as the birthplace of stars. In a stroke of genius, Haydn starts out “The Creation” with a musical depiction of chaos before the formation of the Universe. One of the most profound moments to me is when the chorus begins singing “and the spirit of God moved upon the face of the waters. And God said: ‘let there be light’, and there was LIGHT!” What a tremendous opening! Could the inspiration for that opening have come from Caroline Herschel, a diminutive woman with a height of only four feet two inches? ​She was a noted astronomer, accomplished lens grinder, also a highly regarded singer and soloist in a time when female scientists and soloists were as scarce as hen’s teeth. My hat goes off to Caroline. She became an acknowledged expert in astronomy and was honored for her work. The gold medal from the Royal Astronomical Society was awarded to her in 1828 "for her recent reduction, to January 1800, of the 2,500 nebulae discovered by her illustrious brother, which may be considered as the completion of a series of exertions probably unparalleled either in magnitude or importance in the annals of astronomical labour." This was the first time a woman was ever honored with such an award in Great Britain. ​Whatever the case may be, we are left with a profound musical legacy in Haydn’s “The Creation.” We are also left with an amazing scientific legacy through the work of William and Caroline Herschel. We are better off for having been exposed to their collective genius. The last time I sang “The Creation” by Haydn, my focus was on the exuberant tone of much of the music. This time, I will be thinking about the limitless universe that Haydn came to appreciate and depict in his music. I will also be thinking of Caroline Herschel, a woman way ahead of her time personally and scientifically who may have been Haydn’s celestial connection. ​You too can experience “The Creation” by Franz Josef Haydn and draw your own conclusions. The Florida Orchestra and The Master Chorale of Tampa Bay will present “The Creation” on Friday, March 22 at Idlewild Baptist Church in Tampa, on Saturday March 23 at Mahaffey Theater in St. Petersburg, and on Sunday, March 24 at Ruth Eckerd Hall in Clearwater. From the Risers: "We're Gonna Sing, Sing, Sing!" ​For four decades, the Master Chorale of Tampa Bay has been an artistic force in the Tampa Bay area, whether as part of choral masterworks concerts with the Florida Orchestra or through memorable self-produced concerts that advance the art of choral singing. For many of these past forty years, the primary audience consisted largely of adult concert-goers. Although the Chorale has been engaged in supporting choral music education for students in high school, undergraduate and graduate programs all of those 40 years, about three years ago the Chorale began a concerted effort to reach out to a much younger audience. The new Education and Outreach Initiative, conducted by Deah McReynolds, is a program geared to introducing elementary aged children to live choral music performed at a high artistic level. Master Chorale singers have volunteered to sing in the Outreach and Education Ensemble, a smaller ensemble from the larger 150-voice Master Chorale, as part of that initiative and present both in-school interactive choral music education programs as well as day-time and age-appropriate professional concerts at major venues in Tampa and St. Petersburg. 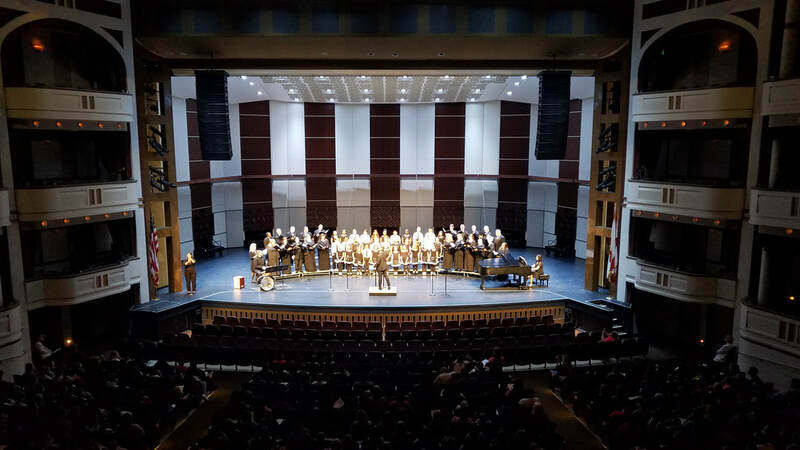 Most recently during the fall of 2018, the Master Chorale visited elementary schools in Hillsborough and Pinellas Counties and are currently between two day-time concert presentations titled "Going to the Show." On Tuesday, February 5th, excited students came to Mahaffey Theater in St. Petersburg for our first of two “Going to the Show” events that we have planned this season. This concert program is now part of Mahaffey Theater's Class Acts presentations, which offers a wonderful array of cultural initiatives for children. We are thrilled to be partnered with Mahaffey Theater and Bill Edwards Foundation for the Arts and most grateful for their co-production on this special program. 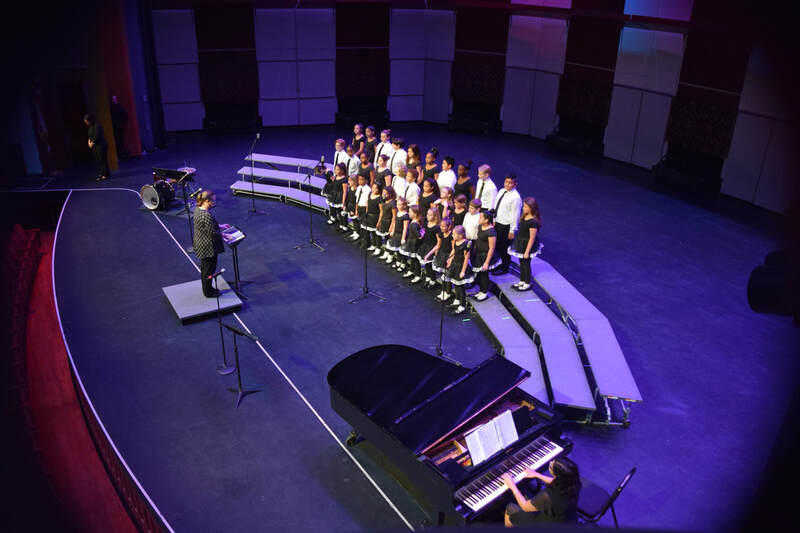 ​“Going to the Show” addressed six different standards for music education set by the State of Florida. This was done by presenting a concert program with a focus on interaction between the singers and the students in the audience. Songs presented by the Chorale's Education and Outreach Ensemble offered examples of four-part harmony through songs such as Lloyd Pfautsch’s “Consecrate the Place and Day”, Tim Osiek’s “Like a River in My Soul”, and Carly Simon’s “Let the River Run” as arranged by Craig Hella Johnson, which ended in an energetic hand-clapping recapitulation of the main theme. The Chorale also presented some interactive singing. With Deah McReynolds directing, along with Theresa Ancaya as accompanist and Elwood Bond on percussion we introduced three different melodies; “Swing Low Sweet Chariot”, “When the Saints Go Marching In” and “I’m Gonna Sing, Sing, Sing”. Each theme was introduced separately, then two themes were sung together by different sections, then three themes were sung together. Each section made different motions based upon the melody we were singing. We even had the children in the audience participate, having them sing “When the Saints”, marching in place as they sang. The children really seemed to enjoy it, and we all even finished together! What fun! ​We sang one song that I personally had a feeling would create a buzz with the children. It was “How Far I’ll Go” from the animated Disney film “Moana”. Being a grandfather to six small children put me in touch with how much children love this film. My granddaughter watches this movie every time she visits us, and even though she is not yet in Kindergarten, she knows the lyrics by heart and sings each time Moana sings them in the movie. I loved it when a loud murmur coursed through the audience once Soprano Victoria Iannuzzi began singing the solo line. I could see many children mouthing the lyrics as we sang them on stage, creating a special musical bond between us and them. Although the Master Chorale provided adult singers for this event, Frontier Elementary was invited to bring their singers as a demonstration choir. Frontier brought a combined ensemble made up of their Honor Chorus and an ensemble with the neat moniker, “The Baby Grands”. Prepared by Chorus Conductor Kate Holmes, they sounded fantastic! They sang “Keep Your Lamps” by Victor Johnson, and then with Master Chorale Alto Kerry Mayo as soloist, they sang Leonard Cohen’s “Hallelujah”. For the concert finish, Master Chorale's Artistic Director Brett Karlin led the Education and Outreach Ensemble, combined with the Honor Chorus and the Baby Grands to create a combined choir for a rousing performance of “Lift Every Voice and Sing”. The high energy finale was Edwin Hawkins’ “Oh, Happy Day” with Master Chorale Soprano Sherry Fagan Martin belting out the solo line. We look forward to presenting this program again to elementary students in Hillsborough County at the Tampa Theatre in March. ​Even though singing as an adult has brought me tremendous joy, I still recall those magic moments when my elementary school music teacher, Miss Passenger, brought out my love of music and an appreciation of the beauty that music can bring. The children who attended this event may have experienced a similar moment, either at Mahaffey or perhaps at the hands of their own music teacher. To be a part of creating one of those moments is a special honor. The performance at Mahaffey Theater was co-produced by Mahaffey Theater and the Bill Edwards Foundation for the Arts, and the Youth Initiative program is made possible through the generosity of Cynthia and Peter Zinober, donors of The Master Chorale of Tampa Bay, and sponsored in part by the Tampa Bay Times (official media sponsor of The Master Chorale), the City of St. Petersburg, and by the State of Florida, Department of State, Division of Cultural Affairs, The Florida Arts Council, and the National Endowment for the Arts. Master Chorale of Tampa Bay had the honor to be recognized in Chorus America's quarterly magazine, The Voice. In the 2018/19 Winter issue, choruses across the country were recognized for upcoming anniversaries of their organizations. The article highlights key each organization's accomplishments cultural and societal influences, and reflections on why they exist. With Master Chorale's 40th anniversary celebrations this season, it is a time to reflect on MCTB's mission, members, past members and conductors, and supporters along the way. Our managing director Kara Dwyer is featured acknowledging the contributions of 'present and past members' as one of the key components for anniversary observances. You can read the full article below. Thank you to Don Lee and The Voice for recognizing Master Chorale of Tampa Bay among the many choral anniversaries! The Master Chorale of Tampa Bay is proud to announce the 2018 Christmas Carol Competition. Instrumentation for 2018 Competition: Choir & Piano. Voicing: SATB, 150-voice auditioned chorus, medium to difficult level (may voice up to SSAATTBB divisi) & Piano. Text: English or Latin text only, sacred or secular, medieval to present, appropriate for concert setting; proof of public domain or author’s written permission for use of text is required. (Please note: most modern translations of the Bible are protected by copyright). The music for this Carol should be original - not an arrangement of an existing carol. Duration: no longer than 4 minutes. Performance: The winning composition will premiere in Tampa Bay early December 7 - 9, 2018. If possible, the winner of the contest shall arrange to be present at the premiere. Additionally, The Master Chorale reserves the right to the premiere commercial recording of the winner. Originality: The work must be an original unpublished composition with no prior public performances. Arrangements of compositions that have received a public performance will not be accepted. Any public performance before December 7, 2018, whether it is by students, faculty, amateurs, professionals (paid or unpaid), and whether it was in a private, public, or academic venue, disqualifies the composition from the competition. A ‘public performance’ also includes formally attended public reading sessions, broadcast, or any recording that has been commercially released. Deadline: Score and application materials must be received on or before October 12, 2018. Results will be announced on October 29, 2018. The winner of the Christmas Carol Competition shall provide final performance score on or before November 2, 2018. Age restriction: The competition is open to any United States resident, age 18 and above. How to apply: All scores & recordings must be anonymous and marked only with a pseudonym of the composer’s choice. Materials that have not had all identifiable markings removed will not be accepted. The composer’s pseudonym and the title of the composition must be marked on each score and recording. Recordings will be accepted (and highly appreciated), but are not required. If a recording is included, please either include ONE flash drive or email a MIDI or rehearsal recording in the format of an MP3 – do not send cassettes, CDs, or data discs. We are pleased to welcome Brett Karlin as our new Artistic Director! Brett brings an exciting combination of talent, entrepreneurial zeal, and a deep connection to our mission. He is a rising star with tremendous energy and passion for choral music. With his commitment to the highest standards of artistic excellence and exuberance for the advancement of the choral art-form, we look forward to many exciting opportunities in our community, nationally, and abroad. "I am absolutely thrilled to be the next Artistic Director of The Master Chorale of Tampa Bay. It's an extraordinary organization with a high-caliber artistic tradition and wonderful relationship with the Tampa Bay community. I look forward to building on the Chorale's 40-year legacy, and exploring new and unique ways to engage both our singers and audience." In addition to being our Artistic Director, Brett will be maintaining his positions as Artistic Director for Master Chorale of South Florida and Music Director of the Broward Symphony Orchestra. We are delighted to share Brett with such wonderful organizations as we know it will increase opportunities for our singers and audiences in Tampa Bay, South Florida, and beyond to experience the joy and power of choral music. Leading performances praised as "intense, richly detailed...polished and well-crafted" (Miami Herald), "finely nuanced and expressive" (South Florida Classical Review), and "integrating choral and instrumental sonorities with clarity and impact" (Palm Beach Arts Paper), Brett Karlin is quickly establishing himself as a dynamic conductor of choral-orchestral masterworks. Having worked with a wide variety of ensembles, Karlin is a passionate performer of large-scale symphonic masterpieces, while equally at home with historically informed performances of distinctive Baroque repertoire. ​The performances of Giuseppe Verdi’s Requiem by The Florida Orchestra and The Master Chorale of Tampa Bay are only about a month away on the weekend of April 20-22. As part of The Florida Orchestra’s Masterwork Series, Verdi’s Requiem is one of the most dramatic Requiems in the choral repertoire. When I prepare for a Masterwork Concert, there are several components to my preparation, including score study, individual practice, and rehearsal with my Master Chorale colleagues. To further enhance my understanding of the music, I research the history of the music, so I can better appreciate what the composer was trying to achieve in composing and performing it. During my research for this concert series, I uncovered several facts about Verdi and his Requiem. Some of these facts are very well known, while others may qualify as trivial or little-known facts. I would like to share the facts I uncovered. The story of Verdi’s Requiem begins in 1868, with the death of Gioachino Rossini in Paris. Verdi suggested that the city of Bologna, where Rossini grew up and first tasted success, honor him with a composite “Messe per Rossini,” commissioning separate movements from Italy's leading composers. The idea was approved, and the various movements were assigned. Diplomatically, Verdi was given the final “Libera me” and the mass was completed, but a performance never took place. At the time of Rossini's death, Verdi called him "one of the glories of Italy," asking, "When the other one who still lives is no more, what will we have left?" The other one was Alessandro Manzoni, a celebrated poet, and the author of the landmark nineteenth-century novel, “I Promessi Sposi” (The Betrothed), a book Verdi himself had read when he was sixteen. When Manzoni died on May 22, 1873, Verdi returned to the idea of a requiem. When poet and novelist Alessandro Manzoni died, Verdi was too grief-stricken to attend his funeral, and the entire country mourned the loss of one of its leading cultural icons. Verdi shared the same national aspirations that Manzoni had, and Manzoni’s literature helped fuel an Italian national identity. Verdi also supported Italian unification, and his last name was used as an acronym for support of unification under Sardinian King Victor Emanuel: Vittorio Emanuel, Rei di Italia (Victor Emanuel, King of Italy). Following unification in 1860, Verdi served as a Senator. ​Verdi went to the mayor of Milan and proposed composing a memorial in the form of a requiem to honor the memory of Manzoni. Verdi reworked the existing Libera me from the “Messe per Rossini” and incorporated thematic material from it in the other movements. While he was quite sincere in his desire to memorialize Manzoni, Verdi, a successful businessman, was also aware of the commercial possibilities for the Requiem. While he was negotiating with the city of Milan to underwrite the premiere and with the Church to allow women singers to appear, he was also arranging publication and performance royalties. As part of the arrangement with the city of Milan, Verdi offered to pay for the score printing himself on the condition that Milan assume responsibility for the cost of the performances. The premiere took place in May 22, 1874, at the Church of San Marco as part of a liturgy so no applause was allowed. Women (Soprano Theresa Stolz and Mezzo Maria Waldmann, soloists who performed in Verdi’s European premiere of Aida four years earlier) were given a special exemption to perform by the local Archbishop on the condition that they must be veiled in black and hidden behind a grating. Verdi also arranged three concert performances at La Scala a few days later which were greeted with great enthusiasm. In the year following the premiere, it was performed all over Italy, in Paris, London, Vienna and even in America. The Requiem had become one of Verdi's most popular compositions. ​Verdi composed his Requiem with Soprano Theresa Stolz and Mezzo Maria Waldmann in mind as the female soloists. Soprano Stolz has been described as "the Verdian dramatic soprano par excellence, powerful, passionate in utterance, but dignified in manner and secure in tone and control” and premiered many of Verdi’s Operas. Verdi hired Mezzo Waldmann for the mezzo-soprano role in his Requiem, for which he wrote the Liber Scriptus with her voice in mind. Verdi particularly valued her for the rich, dark color of her lower, contralto register. For a Paris performance, Verdi revised the Liber Scriptus to allow Maria Waldmann a further solo for future performances. Previously, the movement had been set for a choral fugue in a classical Baroque style. With its premiere at the Royal Albert Hall performance in May 1875, this revision became the definitive edition. When German conductor, composer, and virtuoso pianist Hans von Bülow, a close friend of Verdi’s rival Richard Wagner, stole a look at the Requiem score just days before the Milan premiere, he offered his famous snap judgment, "Verdi's latest opera, though in ecclesiastical robes," and decided not to attend the concert. When he finally heard it, at a parish performance eighteen years later, he was moved to tears. Bülow wrote to Verdi to apologize, and Verdi replied, with typical generosity, that Bülow might have been right the first time. By then, Verdi had grown accustomed to critical disdain, especially from the followers of Richard Wagner. And he knew that Bülow, who once switched his allegiance from Wagner to Brahms, wasn't the last listener who would change his mind about this music as well. ​Playwright and music critic George Bernard Shaw had a different opinion. Attending the London premiere, Verdi’s Requiem captivated him. His first impression stayed with him, as he had the “Libera me” performed at his funeral in 1950. In January 1901, while staying in Milan, Verdi suffered a stroke. He died a few days later. Arturo Toscanini conducted the vast forces of combined orchestras and choirs composed of musicians from throughout Italy at his funeral service in Milan. To date, it remains the largest public assembly of any event in the history of Italy. Verdi’s Requiem experienced a resurgence in popularity in the 1930’s, and one of the most interesting and disturbing chapters in its history took place between 1942 and 1944, when 16 performances were held in the Nazi concentration camp at Terezin (formerly Theresienstadt) in Czechoslovakia. The story begins with Rafael Schacter, a pianist and conductor who was a Czech Jew. On November 30, 1941, he was transported to the Terezin Camp as part of the Holocaust. Terezin was a former Czech fortress and walled town that was set up as a ghetto for Jews who were later taken to Auschwitz-Birkenau and other death camps. Allowed to take only one suitcase, he filled it with items he treasured, including scores from Verdi’s Requiem and Dvorak’s Carnival Overture. The Nazis tried to make Terezin a model village as an example of how they were treating Jews humanely. Part of the façade was to create an active cultural environment in the ghetto, so shortly after arriving, Schacter was given the task of assembling a choir of 150 to perform Verdi’s Requiem. Not having enough scores for all the singers, he taught them the music by rote. The first performance took place in January 1942. In a postscript to the Terezin story, it is worth mentioning that Rheinhard Heydrich was also the SS Officer who ordered SS and SA troops to carry out the Kristallnacht in 1938, where Jewish synagogues, homes and businesses were attacked and burned all over Germany. English composer Michael Tippett was appalled by the news of the attacks and decided to memorialize the tragedy in music. His composition, “A Child of Our Time,” is on The Florida Orchestra and Master Chorale schedule for November 9 - 11, 2018, on the 80th anniversary of Kristallnacht. ​Giuseppe Verdi’s Requiem has been loved by audiences and performers since its premiere in 1874. It is recognized as one of the most frequently performed masterworks in the choral repertoire. For me, I will have a completely different emotional connection to the Requiem because of the research I completed for this blog post. Foremost in my mind will be the unknown victims who created a work of drama and beauty in the face of death and terror. I am drawn to recall the opera “Nabucco” by Verdi, where in The Chorus of the Hebrew Slaves, they sang “let the Lord inspire you a harmony of voices which may instill virtue to suffering.” For the prisoners of Terezin, the closing “Libera me” (Deliver me) was their most fervent plea for deliverance. Even if you have listened to recordings of Verdi’s Requiem, the beauty and drama of the music is best experienced during a live performance. Please consider attending one of our concerts to experience it yourself. The Master Chorale's Youth Initiative is a music education program serving elementary students primarily in Title 1 schools in our community. The program offers a unique, hands-on approach to music education and choral performance free to the students. ​Nothing compares to seeing the amazed face of a very young person when they realize that they can sing and add beauty to our world no matter what they choose to do in life and no matter where they go. "We are indebted to you and Master Chorale for providing a rich choral experience for our students!" "...there was a perfect balance of performance, entertainment, engagement, and education – a difficult balance to pull off!" "Having five young kids of my own, I know the importance of musical interaction in a child's life. Music brightens their eyes and sparks an inner excitement in their minds. It's magical. I see the value in this program and I am honored to help make it a reality for our community's youth." ​- Donald E. Phillips, Managing Director, Phillips Development and Realty. Thank you to our sponsors and donors for supporting this important program! We are grateful for the support of USAmeribank (which funded buses for all students to attend our day-time professional concerts at the Tampa Theatre and the Palladium Theater this year), Phillips Development and Realty and Construction Services of Tampa (both provided much needed funding to cover concert venue expenses). We also receive support for this Youth Initiative program from Publix Super Markets, the City of St. Petersburg, the City of Tampa, the Arts Council of Hillsborough County and the Hillsborough County Board of County Commissioners, and it is sponsored in part by the State of Florida, Department of State, Division of Cultural Affairs, the Florida Council on Arts and Culture, and the National Endowment for the Arts. From the Risers: "Dacci un Dramma!" ​Yes! “Dacci un Dramma!”, or in English “Give us drama!” is the topic of my latest post. I was drawn to this phrase because the current season of the Master Chorale of Tampa Bay is all about drama, especially the way we create it through our voices in collaboration with The Florida Orchestra. To make it more interesting, this season is unique in that through four concerts, we take a “grand tour” of the history of creating drama with the voice through several musical genres that go back five hundred years. Let us take this tour in chronological order, even though the concerts this season do not necessarily follow that order. ​Genre #1: Opera. Opera was the first musical form that combined voices and instruments to create drama as entertainment. The first opera, “Dafne” was composed by Jacopo Peri in Italy in 1597, although it is now largely lost. The earliest opera still performed is Claudio Monteverdi’s “L’Orfeo” composed in 1607. The opera genre was exported to Germany in 1627 and later to England and France in the mid 1600’s. As an art form, the opera has been widely performed up until the current time, although the mid to late 19th century is widely recognized as the “golden age of opera”, dominated by Richard Wagner and Giuseppe Verdi. ​Giuseppe Verdi started composing his Requiem in June 1873, shortly following the death of famed Italian writer and humorist Allessandro Manzoni, whom Verdi met in 1868. Manzoni’s death was the impetus for Verdi to write a complete Requiem, expanding upon the “Libera me” that he wrote in Rossini’s memory following his death in 1868. Verdi’s Requiem is not normally regarded as a liturgical Requiem and is primarily performed as a theater piece, and the music is infused with the same level of drama we would encounter in his operas such as “Aida” (1872) or “Othello” (1887). For me as a singer, I love dramatic moments such as the pounding of the bass drum in the “Dies Irae”, the unison opening of the “Sanctus” or the power of the opening phrase in the “Rex Tremendae”. The Verdi Requiem will be performed with The Florida Orchestra on the weekend of April 20-22. Genre #2: Musical Theatre. Musical theatre grew out of the comic operettas of the 1800’s by composers such as Jacques Offenbach in Paris and Johann Strauss Jr. in Vienna. From 1871 to 1896, William Schwenk Gilbert and Arthur Sullivan collaborated on numerous comic operettas such as “The Pirates of Penzance” and “The Mikado” that poked fun at English society and became internationally famous. 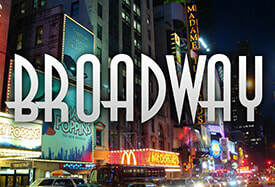 In America composers such as George M. Cohan and Victor Herbert gave musical theatre a distinctively American flavor. Throughout the first four decades of the 20th Century composers such as Jerome Kern, George and Ira Gershwin, Cole Porter, Rodgers and Hart and Irving Berlin popularized the musical theatre genre. Songs from musicals have become part of The Great American Songbook and an integral part of American culture. Concertgoers will be able to hear many of their favorites in the “Celebrate Broadway” concert series with The Master Chorale and The Florida Orchestra during the weekend of April 27-29th. Genre #3: The Film/TV Score. As musical theatre became a dominant force in bringing live music to the masses, the advent of films allowed even more people to experience the way music can combine with the moving picture to add drama and meaning to a story. The development of talking pictures starting with “The Jazz Singer” in 1927 added the component of sound to movies. This film incorporated a musical play where singer Al Jolson played a cantor’s son who ran away from home to become a famous jazz singer. The film is recognized as one of the 100 most influential films of all time. Since then, music has combined with voice to add drama to the movie-going experience. Many successful pairings were film versions of musicals, such as “Oklahoma” or “My Fair Lady.” But voices were used in other film genres too, such as Ennio Morricone’s score for “The Good, The Bad, and the Ugly.” During February, the Master Chorale of Tampa Bay singers joined forces with The Florida Orchestra to present “The Music of Star Trek and Star Wars.” I am a huge science fiction fan and was able to enjoy this concert as an audience member. The concert opened with the Star Trek original series theme, taking me back to my high school and college days when the series was in its heyday. In hearing this music exclusive of the TV or movie images, it was easier to concentrate on the beauty of the music and the voices stood out even more, bringing an ethereal feeling to the theme. Likewise, the addition of voices to the “Star Trek: Into Darkness” film score added to the drama of a conflict between Kirk and the super-being, Khan. ​In the “Star Wars” segment of the concert, the vastness of space and the drama of human conflict were brought to life by composer John Williams, one of the greats among movie score composers. In the “Battle of the Heroes” segment, voices combined with the instrumental score to add drama to the climactic battle between Anakin Skywalker and Obi Wan Kenobi and added a heightened level of finality to Anakin’s descent into the dark side. Like adding spice to food, the addition of voices made the drama of these moments even more palpable, creating lasting impressions that make me want to return to the theater to see the film again. Genre #4: The Video Game. Since the advent of electronic gaming in the late 1970’s, their complexity of the stories and images has been increasingly coupled with the development of music scores that are now equal to and in some cases exceeding the level of artistic expression in film scores. We are now light years beyond the “beeps” and “boops” we heard when playing “Pong” or the simple 8-bit compositions we heard when playing “Donkey Kong” almost 40 years ago. Video game score composition now attracts some of the best composers who have embraced this avenue of artistic expression. These include Koji Kondo (Legend of Zelda), Jeremy Soule (The Elder Scrolls) and Michael Giacchino (Medal of Honor). Michael Giacchino also composed music scores for J.J. Abrams, producer of the current generation of Star Trek movies. Nobuo Uematsu, composer of the Final Fantasy music scores has been composing them for more than two decades, and concerts of his music play to sell-out crowds around the world. Such was the case on January 26th and 28th, when guest conductor Arnie Roth directed the Florida Orchestra and the Master Chorale Ensemble Singers in the “Distant Worlds: Music from Final Fantasy” concert series. In an interview, Nobuo Uematsu noted that his scores “are the closest thing to large-scale evocative symphonic works from films.” Hearkening back to the opera genre, Uematsu creates leitmotifs for his characters. 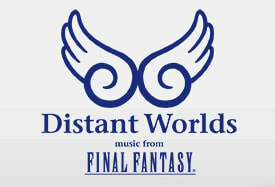 For example, the Chocobo theme has been present in all the Final Fantasy scores since December 1987. Arnie Roth, after directing the Final Fantasy Concerts here, noted that if he knew ahead of time how skilled the singers were, he would have programmed even more choral music into the concerts. What a tribute to my Master Chorale colleagues! ​In conclusion, do you remember what we were discussing 1,300 words ago? Looking back at the operatic roots of combining the human voice with instruments, we can see a kind of musical karma. I think if Richard Wagner were alive today, he would enjoy an animated conversation regarding leitmotifs with Nobuo Uematsu. What is seen through these very broad brush-stroke discussions of musical history is the unmistakable impact the human voice can have on listeners. The current Master Chorale Season still offers opportunities to experience live music that you will find enjoyable and memorable. As a singer, it is a joy to be a part of the creative process that takes place when we prepare and present great music for our Tampa Bay community. We are deeply grateful for grant awards from the following organizations, which help make our programs possible. With the support of the Arts Council of Hillsborough County and the Hillsborough County Board of County Commissioners. ​Sponsored in part by the State of Florida, Department of State, Division of Cultural Affairs, the Florida Council on Arts and Culture, and the National Endowment for the Arts.